Travel with Kevin and Ruth! : Scorpion! One of the campers killed one in his campsite the other day. He brought it over to show me, and sure enough it was a scorpion. I didn't think at the time to take a picture, but you know what a scorpion looks like. This one was just over an inch long, and fairly light in color. Yikes. They are nasty looking creatures, aren't they? So I did some research. It's called the Northern Scorpion, and while it is found in some southern states as well, it is the only scorpion to be found in Canada. It's range in Canada is listed as "valleys in southern Alberta, with some limited range into British Columbia and Saskatchewan". And they specifically mention the South Saskatchewan River valley where our park is located. Coincidentally, Ruth says she had a quick glance of what she thought was a scorpion in one of the bathrooms the other day, but dismissed it as being a spider, but now she thinks that it must have been a scorpion. We also have rattlesnakes in this area, although nobody has every reported one around the park. The prairie rattlesnake is found in a very small range in Canada, said to be only in southeastern Alberta and southwestern Saskatchewan. And, I learned that we also have wild boars here in Saskatchewan. They're becoming a nuisance in the province, and are now one of the very few animals that you can hunt and kill without any kind of a licence. Apparently they're in this area now, but again we have never seen one. They're said to be aggressive and dangerous. Head the other way if you see one! Interesting. You learn something new every day! I did not know we had scorpions in Canada, you learn something every day. We do have black widow spiders here in BC, plus a host of other really gross large spiders. The only snake I have ever seen here is a garter. We didn't know this either, until now of course! I can't get over all the different wildlife we have seen at the park this year. So many different ones from our other two years here, and we love it, Scorpions and all! Nasty looking creatures, these scorpions, I killed two of them in our rental house in San Miguel. Wild boar are good to eat! They are all over Itlay and France and hunted by the locals. They are very strong and aggressive when cornered... Hope the peace and quiet has returned to your park. Yep, they are pretty nasty looking but also interesting to look at! Yes, we have heard that they are more common in parts of Europe. We caught sight of one when we were hiking in Arizona as well, and we saw some guys hunting them that same day. Amazing what you can find in wild. There is a local fellow around here that raises "wild" boar and apparantly are good eating like Peter said. Can't beat it on the Weber,with a side salad and some asparagus and a glass of red,Life is good,but only wild. Well guaranteed we won't be hunting them but if someone were to offer us a bit of meat to taste we wouldn't turn them down. 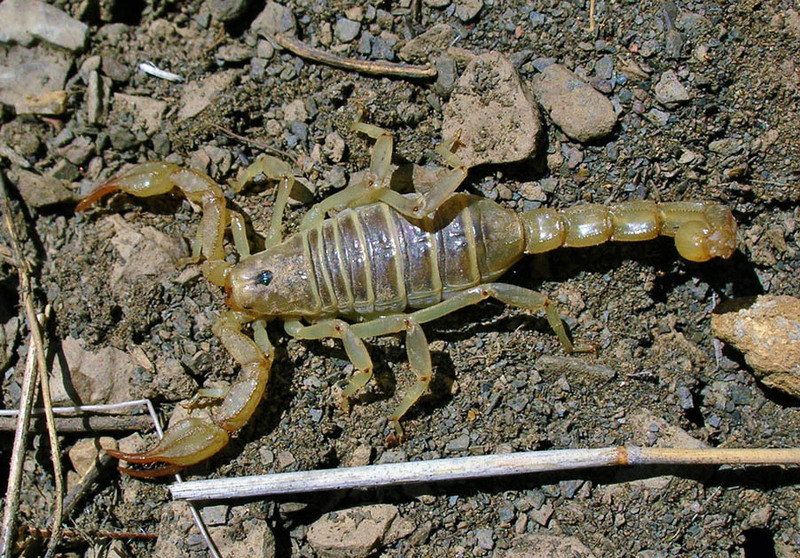 I was just reading about the Northern Scorpion in a Nature Guide I carry around while camping... from the book ... "the northern scorpion's sting is no worse than a bee sting. Remember to treat these rare animals with respect and let them go about their business." That is interesting! I never would have guessed you'd have scorpions there. Oh good grief! If I would see one of those things in my bathroom, you would hear my scream all the way to Canada. The one I saw was so tiny, you would have thought it was just a bug or spider and not given it another thought, just like I did. It sure looked liked a scorpion up close but I shook my head and said it can't be because they don't live here so it must be something else. I wonder how they winter. Scorpions mate LOTS of babies and they live on the mother's back for months. My friend bought a scorpion once that we didn't know was having babies, it was really neat to see once they all came out! I would expect that they hibernate just like they do in Arizona during the cold weather. We have found a scorpion with babies on her back when we were down in Mexico a number of years ago. It was nasty looking but we left her be as she was outside.